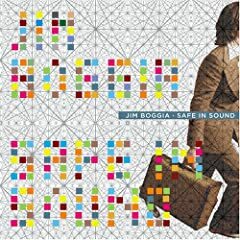 Absolute Powerpop: My Top 20 of 2005, #12: Jim Boggia-Safe In Sound. Philly's Jim Boggia certainly gets around, having played with many fine musicians over his career as (mostly) a session man and touring sideman. His second solo album, Safe In Sound, finds him calling in some favors from big names and creating a great power pop album. The MC5's Wayne Kramer helps out, as does Aimee Mann, Pete Thomas from Elvis C's Attractions and Jill Sobule, but the real coup was getting the reclusive underground pop legend Emmitt Rhodes to co-write a track and contribute backing vocals. As any avid movie watcher will tell you though, a great cast doesn't necessarily make a great movie. But that's not the case here as Boggia has come up with a bunch of future classics. Highlights are many, including the track co-written with Rhodes, "Let Me Believe (Evan's Lament)", a bouncy Beatlesque number; the propulsive "Live The Proof"; and the opening number, the should-have-been-a-hit "Shine". No mp3s for this one, but he's got three tracks, including "Live The Proof", streaming at his myspace page. You can get some 30-second snippets here, and it's for sale in the Amazon Marketplace for only $5 new, a real bargain. It's not available on eMusic, but his first solo album, Fidelity Is The Enemy, is.